Fiber arts are all about texture and feel, hue and tone, art and creativity, and Village at Wexford’s Needlepoint Junction is the lovely, tactile atelier at the heart of the Lowcountry’s needlecraft community. Brimming with yarns and threads, needles and hooks, canvases and inspiration, the Hilton Head Island shop is filled with all the touchable ingredients needed to inspire. 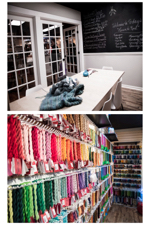 Owner Michele Kay-Greene has staffed her shop with a troupe of passionate needle crafters who heartily share their experience, skill, and advice, assisting customers with project and materials selection, teaching classes, and mentoring stitchers of all ages, from beginners to experts. Understanding the business, but not necessary the art, Kay-Greene relied on some advice she had been given by her father: “Surround yourself with people who are smarter than you (otherwise known as the experts), and use them to their best capabilities and abilities. 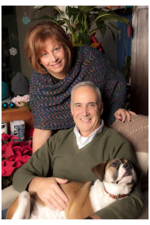 Doing that, you’re empowering them, number one, and number two, you’re creating a team that knows everything and can handle everything.” The Needlepoint Junction team members know their stuff. “What they do just blows my mind. I have great knitters; I have great crocheters; I have great needlepointers who work for me. Everybody is willing to share something with you,” Kay-Greene said. 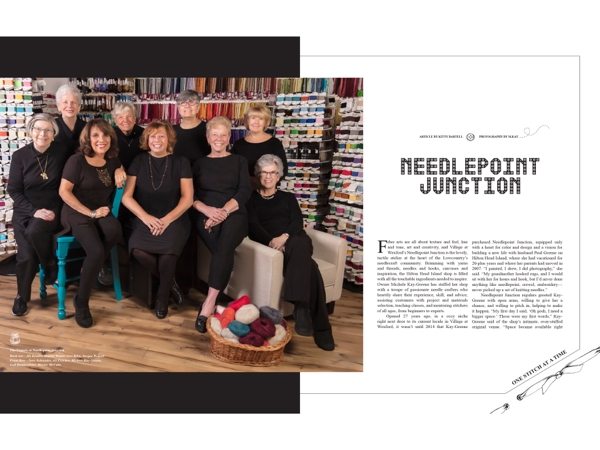 Celebrating the grand opening of their larger space in February of 2016, Needlepoint Junction has become the perfect creative outlet for local and visiting fiber lovers. The sample work displayed throughout the shop provides inspiration for selecting the perfect project, and stitchers are enticed to enroll in the growing number of learning opportunities offered in the splendid classroom. Surrounded by samples infused with imagination and talent, the classroom is getting busy, and the team looks forward to adding more teaching events to their schedule in the coming months. Adult classes encompass as many stitching disciplines and projects as can be conjured in the imaginations of her team members or from the suggestions of their customers, and Kay-Greene is open to new ideas. “We do trunk shows and would like to do seminars,” she said. “We’re interested in building an outreach program—going into homes and communities with classes and information.” Needlepoint Junction is also scheduling classes with Theresa Thomas, a master knitter, who designs, produces, and teaches the most inspired projects. Watching a team member assist a customer with project and material selection is part of the fun for Kay-Greene. “With needlepoint, your canvas has lots of colors on it, and it’s a design, but it’s how you bring those colors to life; even though the canvas is painted, it is still blank.” On any given week, customers will find guidance from and camaraderie shared by Marnie, Theresa, Gail, Darla, Ali, Jill, Sharon, Geri, Jacque, and June—each with different palette sensibilities and styles. Kay-Greene says that even when she hasn’t been in the shop, she can suss out who has been working by seeing what threads and yarns and canvases have been sold. Team members bring particularly unique sets of creative fingerprints to their work at Needlepoint Junction. Needlepoint Junction is in Village at Wexford at 1000 William Hilton Parkway, Suite J7E, Hilton Head Island. For more information, please call (843) 842-8488 or visit needlepointjunctionhhi.com.